When your turn ends, you may name a card type. Gain 2credit the first time each turn the Runner plays or installs a card that has the type you last named this way. If the Corp names "event" for the card type for Azmari EdTech, does the Corp still gain 2 if the Runner plays Employee Strike? No. Following the rules for playing events, "when played" abilities do not meet their trigger condition until the even in question is active in the play area. Employee Strike blanks Azmari EdTech as soon as it becomes active, so its ability is no longer active and cannot trigger. Do you like to rush? Do you like control? Did you like the card Targeted Marketing, but instead wanted it in ID form, and arguably just as strong? Have we got an ID for you! -40 card minimum which means this thing is meant to go fast, and it definitely can. -15 inf despite what I think is a pretty bonkers ability, so can we get a heck yeah. -Sure, it may not get you 10 credits all at once like TarMar, but how often did you get that anyway? With all the good runner currents and recursion, probably not often. But even with limited testing, I can attest that this thing fires a lot, and still manages to make the runner install cards before they'd like to, or hesitate to install cards they should. So you get money and control, rather than just the momentary control and zero credits that TarMar often gave you. -Synergizes with Scarcity of Resources in an incredibly nasty way. Pretty much every runner deck in the game tends to use at least a couple of resources (and some people use a ton), and by attaching a four credit swing to the first one each turn, you turn it into the most unattractive option imaginable. Or just slap down a Scarcity and name event--Or program if they're running Mopus--and make every single source of liquid credits demonstrably worse. -Also synergizes with Death and Taxes, for very similar reasons to the above. Cover all your bases, while making certain actions horrific! -The econ this ID provides allows room for more expensive ice (I'm looking at you Tollbooth) or expensive but powerful FA cards, like Calibration Testing and Biotic Labor. Or both! -The effect is around the entire game (barring an Employee Strike), and can fire on both their turn and yours. This is nuts. Sure, you get to make that Hayley's remote run more painful because installing her Cyber-Cypher got you two creds, but you get another two when she installs Clot on your next turn too. Eat it Artist Colony! If you're like me, the side of NBN you've always loved was its ability to use painful methods of resource control to make the runner's life an absolute nightmare. And, well, this is what we've been waiting for. Sleeve up, and teach them a painful lesson in challenging yellow. So, I have to admit, I was somewhat skeptical about this ID when I first read its effect. Sure, it definitely sounded like fun, an ID which rewarded meta and deck knowledge. And as someone who has always played NBN both casually and competitively, I was looking forward to giving it a spin. But I had never thought this deck would have actual potential. And it has. The ability is way more powerful than it seems at first. Most ID's considered amazing give a 1 credit discount/gain per turn. Some of these are even "banned" now. And Azmari gives you 2(!) free credits, without you having to do anything. But, I hear you say, the runner is the one who has control over whether you get your credits or not. The thing is, if the runner is going out of their way to play around your ID ability and deny you cash, they are very likely playing sub-optimally. The number of times I have seen runners drawing cards and clicking for credits like a common peasant for turns on end is mind-boggling. Because of this, Azmari is a great deck to rush out agendas with, This is further helped by the small deck size. It is essential SYNC, combined with some of the control/glacier elements of New Angeles Sol and the speed of NEH. So yeah, I love this ID. Just goes to show that NBN can still dish them out after having received a huge rotation blow. Azmari EdTech: Shaping the Future: A Broken ID? The ID has been out for enough time now for people to have had quite a dabble with it, and what have people reported back? 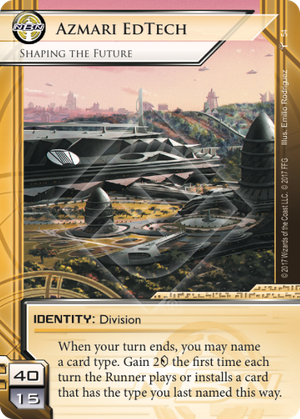 We have a situation here that is much like Kate "Mac" McCaffrey: Digital Tinker and Haas-Bioroid: Engineering the Future, basic plays of cards mean money is made. Of course, there is the argument that Azmari EdTech: Shaping the Future is different because runners can play around the IDs ability, but I think most of us would agree that's not realistic if the runner actually wants to be competitive. Runners in the early stages of a game almost always play events or resources. They want to money up, so they can setup their rig. Alternatively, they want to draw up (say with Earthrise Hotel or Diesel etc.). And more often than not, runners want to link those cards together; E.g. Sure Gamble into Daily Casts, or Career Fair into Earthrise Hotel/Liberated Account. Or even if require just playing one of those cards, if they didn't get a great draw. So just play around it right? For instance, just play a console or program when the corp says event or resource. Let's see how that looks. Click one, install Paperclip, click two, three, and four, click for credits. So now you're back to 5 creds, with one program out and not a run made. No one wants to do that, they'd rather give the corp 2 credits with a money event or resource. Forget consoles, they are usually even more expensive, that's just a crazy tempo hit. Azmari EdTech: Shaping the Future is there just to boost any deck archetype that wants to money up, or retain a good cash flow throughout a game. So Glacier and Rush works well here, or anything where you'd like to out trace and tax a runner. So that's likely 90% of deck types in NBN. This ID in my opinion is just too good. I think we may end up finding ourselves in the same tired situation of Haas-Bioroid: Engineering the Future, where you look at other IDs and just end up going back to the one that makes you passive income because everyone needs money. Employee Strike of course is an answer, but one has to wonder when you need silver bullets about how good an ID is for the game. Besides, even with a Strike out, you're likely just dulling the economic impact, as many corps will pack a range of econ options in the deck, and use Azmari's ID ability as that extra boost to make an economic competition untenable for the runner. I'm not saying this ID is going to break Netrunner, but I think it won't promote creative and interesting archetypes, which is what is so great about the game at the moment (April 2018). We seemed to be moving past these sorts of "best in all cases" situations, and adding some real variety and flavour to the game. I hope this trend in IDs does not continue.